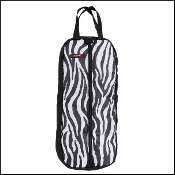 This Tough-1 Heavy Nylon Zebra Print Bridle and Halter Bag has a heavy zipper and 3 quick grip hanging straps inside. It has a double handle and extra padded lining for protection. It measures 28" x 12" with 3 1/2" gusset.